Rarekind launches its first Manchester exhibition on Friday at 2022NQ, bringing together artists just as accustomed to street art as the smaller canvas. It will include work by Faunagraphic whose mural painting in the Northern Quarter is the largest wall ever to be painted in Manchester city centre. Ian Pennington looks forward to the event. Street art outside Soup Kitchen following the HldTght event by artists including Mr Penfold. Photo: Sheila Blige. 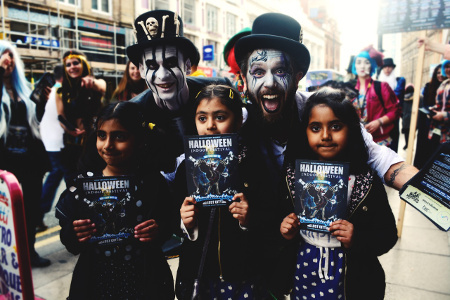 Street art has had a burgeoning presence in Manchester during recent years with Eurocultured Festival annually inviting artists to adorn the walls along New Wakefield Street and last summer’s open Graff Jam event in Hulme proving a success. 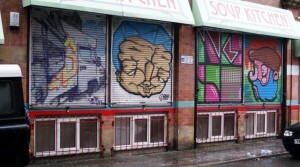 Stevenson Square in the Northern Quarter regularly benefits from creativity visible to the public, including HldTght’s decoration of Soup Kitchen’s shutters in December 2010 and Him Hallows’ sci-fi inspired art on the Out House central reservation project, which is sponsored by Fred Aldous. For the Rarekind exhibition, Faunagraphic will present some scaled down artwork across her trademark themes of fantasy, nature and organic shapes alongside her partner Rocket01, a former HldTght collaborator Mr Penfold, Hammo and others handpicked by the Rarekind Manchester (RK/M) illustration agency. The Rarekind RK/M exhibition is free entry and launches on Friday 13 July. For more information on the artists and agency, visit the event page.